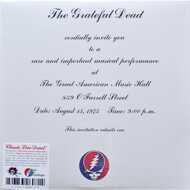 Recorded live at The Great American Music Hall in 1975, this is classic live Dead finally back in print on vinyl after 22 years. Originally only available in Europe, this marks the first ever American LP release. Newly remastered in 2013 with lacquers cut at Cohearent Audio. 3xLP set housed in a heavy 3-panel jacket.